Messes stress people out. Why not remove that stress by organizing your shreds easily and efficiently with something as simple as a box? Our line of shredder boxes are pre-designed to fit into their respective machine and take the hassle and aggravation of dealing with thousands of tiny paper particles. We offer these in both HSM and Martin Yale brand names. Remove the waste bags in and out of you shredder with ease using one of these light weight boxes. Check out our selections below. Dimension is 22.25" X 15" X 10.5"
Box Dimensions: 23.75" x 15.75" x 19.35"
This is MyBinding video. I’m sure you’re tired of cleaning up messy shredder papers; so are we. 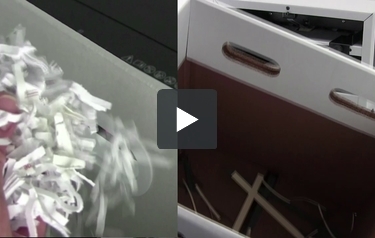 Invest in a shredder box and save yourself time and aggravation. All the major brands make boxes for their big shredders and we carry them all. You simply pull out the box, change the bag, reinsert the box into the shredder. It doesn’t get any easier than that. Happy shredding! When image matters, MyBinding.